If you’re told something repeatedly, it’s hard not to get it stuck in your head. It’s hard not to believe the most awful things people say about you, simply because they’ve said it enough times. And that’s the trickiest thing about bullying. I’ve been rewatching the 14-year-old cartoon Invader Zim, and somewhere in the early hour of around 4am—restless and unable to sleep, turning to my iPad for help in the form of white noise—I realized how warped reality can get when dealing with delusional, mean, scared individuals. It’s all there in that cartoon. Dib is the show’s ostracized kid, the one who is obsessed with paranormal research and is consistently under attack by his classmates in Ms. Bitter’s 5th-grade class. Dib is seen as crazy, a loser, not worth even listening to. Those of us watching the show know better. The reality is that he’s the only sane one in the class. No one else can see through the obvious disguise that the alien Zim wears. They ignore Zim’s weird behavior and shrug off the most blatant alien activity in favor of mocking Dib for his beliefs. In the cartoon, it’s funny. The classmates can barely formulate coherent sentences, and we laugh at their inability to parse the most obvious clues. But as exaggerated as it is in Invader Zim, that rejection of someone who sees the world differently is a very real issue. It’s easier for Dib’s schoolmates to accept that he is just the token class weirdo than it is to accept that something might exist beyond their initial understanding of the world. People fear the unknown. They fear having to change or to adapt to the new or different. It’s easier to convince yourself of whatever narrative most suits you than to try and comprehend other possibilities, not if it means any sense of change. The kids in Ms. Bitters’ class will do practically anything to keep their heads safely in the sand, where they don’t have to consider the possibility of alien lifeforms and a threat to their existence. They convince themselves that Dib is the delusional one, not ever realizing that they’re projecting their own shortcomings onto him. They’ll take whatever measly excuse Zim offers up, just so long as it placates their understanding of him and the world around them. When Zim ingests human organs that were stolen from his classmates so that he could appear more human to the school nurse, he’s considered extra-healthy, despite intestines literally dangling out of his mouth. In a Christmas episode in which Zim dresses up as Santa, it’s Dib who gets ganged up on in the end for destroying Santa-Zim, even though he was clearly murderous. 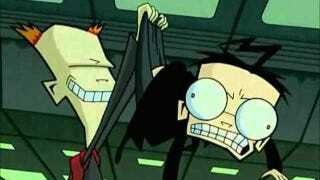 In another episode, Zim gets kidnapped from his classroom by Sizz-Lor the frycook, but, when Dib yells excitedly about this, the class mocks him for some bird excrement that fell on his shoulder. Any time these kids are confronted with something that tests their ability to adapt to reality and to changes to their invented realities, they turn to Dib and lash out, because he’s often the one trying to point it out. He is demonized for daring to help humanity and for daring to help them see reality. The classmates’ delusional narrative and the fear of breaking it combine to create bullies who are mean, because they see themselves as under attack. Dib is the enemy simply because what he says is different from what they believe. Fortunately, Dib never cracks under peer pressure. He is occasionally defeated, but he never worries about being liked and never stops pursuing his goals under his code of values. He puts up with being called crazy, because he knows he isn’t. He sees the greater good in what he does every single time he is ridiculed for it. It’s not that easy for every adolescent kid who has to deal with childish and unfounded mockery. In my earlier years in high school, I was bullied for being an atheist. Even though I felt secure in my beliefs, it didn’t feel great to be ostracized for them. I remember thinking I’d be better off hiding that aspect of myself. Years later, I can more clearly understand that I had nothing to be ashamed of and nothing to hide. We all know that bullies often target people who are different from them and who see these differences as inherent flaws. What is less apparent, perhaps because it is often left unspoken, is that those bullies are usually compensating for their own incompetence. They lash out, because it’s a last resort. Even if they don’t see it, it’s their own discomfort that motivates the bullying. Unfortunately, it’s usually the victims who end up feeling so demoralized by it. It’s easier to see what’s true and what isn’t from the outside. It’s about perspective. When I watch Invader Zim, I’m not connected to the classmates. I have no investment in worrying about a day-to-day experience of spending hours around them. I don’t think about who I might have to sit with at lunch or on a bus to a school trip. For me, it’s simple: Dib is just caught in the unfortunate situation we all find ourselves in sometimes; he’s stuck with people who just aren’t worthwhile, whose opinions ultimately do not mean anything. But when you’re surrounded by it, it’s hard not to let those words get to you, especially if it’s what you hear all day every day. Even as adults we might encounter people who so contradict our lifestyle that they might lash out like kids when confronted with something different that they can’t understand. It’s easier to shrug off when you have the weight of experience to remind you, but it’s occasionally not so simple. You might misjudge someone’s character and grow to care about them only to have them truly reveal themselves on deeper inspection. Emotions confuse reality. But to an outsider, it’s clear who is bullying who and why.